A leader in the booming Christian Hip-hop scene, T-Bone has been delivering his blistering Rap over smooth, driving beats for years. His latest combines obvious gospel passion with strong production. 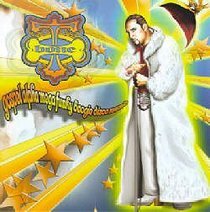 About "Gospel Alpha Mega Funky Boogie Disco Music"
Rene Francisco Sotomayor, better known by the stage name T-Bone, is a Christian rapper. His name came from being called 'Bones' as a youngster because he was very skinny. The 'T' was added to give the name a little "slang edge". T-Bone started rapping at the age of 7 at parties and in "rap battles". He was close to getting a gangsta rap record but his life was transformed and he released his first album Redeemed Hoodlum in 1991, followed by Tha Life of a Hoodlum in 1993 and Tha Hoodlum's Testimony in 1995.